DESCRIPTION OPEN HOUSE SAT. 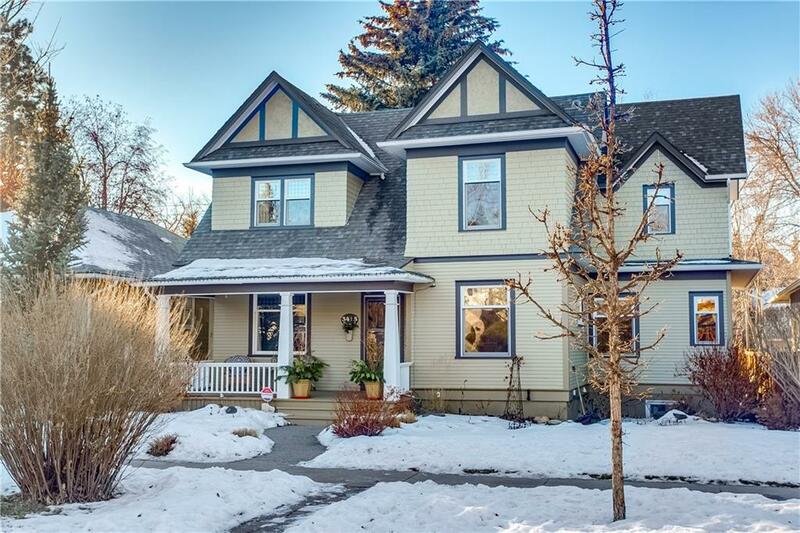 MARCH 9TH 2:30-4:00.Fabulous Elbow Park home with newly painted exterior (2018), 50’x115’ lot on highly desirable 6th Street with close proximity to Elbow Park skating rink and park, Elbow Park school, Rideau Park School, The Glencoe Club, and walking distance to Western Canada High School and the downtown core. This classic 5 bedroom Elbow Park home has been well maintained and renovated in keeping with the character of the home. The private front entry separates the large living room with gas fireplace from the formal dining room. The spacious renovated (2001) kitchen with infloor heat overlooks the huge West facing backyard and large deck. The renovation/addition includes a new main floor bathroom, back entry and locker area also with infloor heat. Most windows have been replaced with double panes which incorporate the original leaded glass, and new interior leaded glass doors complete the main floor. The upstairs includes 4 large bedrooms with sizable closets, a full bathroom and a master and walk-in closet. An original large linen closet and laundry chute to the basement are character features in the home. The completely renovated basement includes a large bedroom with 3 windows, full bathroom, laundry room, rec room and plenty of storage. A new high-tech boiler was installed in 2013 for the radiant and infloor heat and a dedicated furnace for the basement. With the convenience of a central vacuum system and the ability to easily add infloor heat to the basement, this home has been thoughtfully modernized while maintaining the original Elbow Park character.